As many as 50 irked home buyers on Saturday staged a sit-in outside the office of Unitech Limited Group to protest delay in possession of their flats. 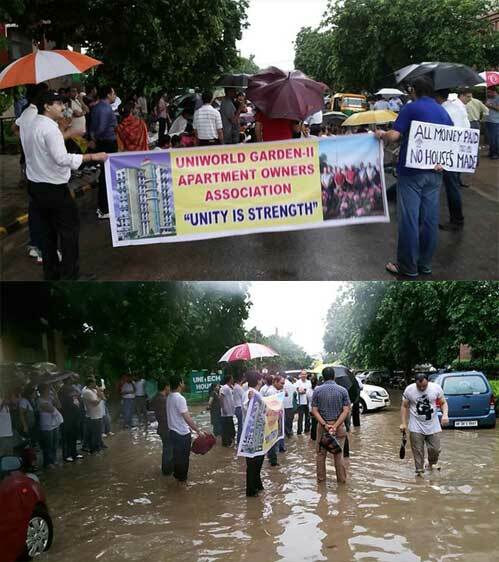 The buyers were supposed to get possession of their flats in Uniworld Gardens II by 2011. But four years after the project was launched in Sector 47, the construction work is still far from over. The housing society is supposed to have 500 flats spread over four towers. The buyers, living across the country, connected through Facebook and planned to raise voice against the developer. “We are fighting for our right to get our dream home on time, as was assured by the developer. We do not see getting the possession for at least the next two years as the construction is still not over,” said Pankaj Kalra, a buyer. The buyers protested outside the realtor’s office in South City 1 after their representatives were not allowed inside the office for a meeting with Unitech executives. This entry was posted on Wednesday, May 29th, 2013 at 6:39 pm	and is filed under Uncategorized. You can follow any responses to this entry through the RSS 2.0 feed. Both comments and pings are currently closed.